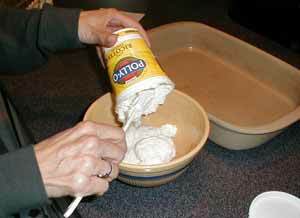 Empty the 15 ounce container of Ricotta cheese into a medium bowl. 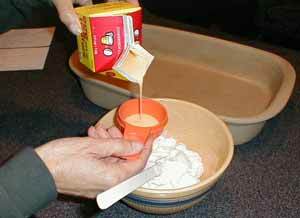 Ricotta cheese LOOKS a little like cottage cheese but DON'T use it as a subsititute. Mamma would never allow that in her kitchen. Drop in two whole eggs (sans shells of course) or better yet, use Egg Beaters egg substitute. They are easy to use and give you a break on choloesterol.